Our third day at Le Méridien started with plans to do a small shoot for our outfit stories. Naturally, we had to get dressed and get out. But it had been pouring all night and on checking from the balcony, it was still raining quite heavily. Our first thought was “OMG! The Writer’s Ball!” This was being set up by the hotel’s team OUTDOORS. And now what? We decided to get dressed and find out. Below left, what I’d be using to get my face ready. I LOVE Crabtree & Evelyn’s Avocado & Basil range. I have the moisturizer and the hair conditioner. Followed by the sunscreen – yes, even when it’s raining and there is massive cloud cover – I swear by Clinique’s 50 SPF ( it’s a body sunscreen but it’s good for the face too – I couldn’t be arsed to buy a separate sunscreen for my face ). A little bit of Fake-Up concealer by Benefit Beauty – especially under the eyes and to even out the redness on my cheeks, followed by a quick pat with the CHANEL pressed powder. The They’re Real mascara by Benefit – it’s waterproof – and the Colossal Kajal by Maybelline. I followed that up with a CHANEL lip color Rouge Coco ( not shown ) mixed with an Ambika Pillai Red Hot lip color. Below right, Akanksha drying out her hair without the hair-dryer. I of course used the hair-dryer from the bathroom. The places we had scouted during the morning were no longer accessible since preparations for the Writer’s Ball were now taking place indoors and boxes and supplies were strewn around. Below, Akanksha with her look for the evening. We had both initially brought dresses with us but it was so cold that we weren’t feeling particularly brave. Despite the cold, the rain had finally abated and we decided to get out and get some quick photographs around the beautiful outdoor space of the hotel. All photographs of me that are not selfies have been photographed by Akanksha. I’m still not very good with being in front of the camera but she doesn’t give up on me so I still have hope. When we were done, we headed back indoors to see that preparations were almost done and early bird guests had already started arriving for the Writer’s Ball! There were three bars that had been set up. Two on the lower level – including one right at the Lobby and the third bar was upstairs, above the Latest Recipe restaurant. We took each other’s pictures in front of all the branding – but we had to get out of the way quickly because guests were pouring in! At least that’s my excuse for the “deer-in-headlights” look. We headed to the bar and my search for hot water + brandy + honey was unsuccessful. The only other available substitute was single malt whisky + hot water + honey and the bartender attending us mixed the honey away from the eyes of the crowd lest someone decided to throw a brick at me. The terrace was crowded with people at the Writer’s Ball checking out the “Emami” wedding. ( I have no idea who was getting married but that’s what everyone was calling it! ) Akanksha is always pleasurable company – especially when I’m feeling the urge to get a good portrait. It started raining again and we ran back indoors. 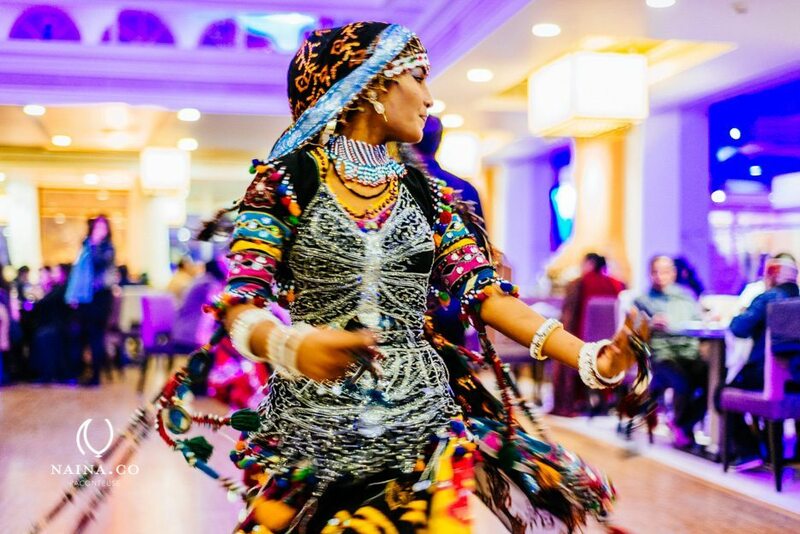 We could soon hear some lovely Rajasthani beats – on the upper level above the Latest Recipe – Rajasthan Josh had collected and had started playing beautiful songs with lilting and very energetic music. Lots of smiles all around and the vibe completely shifted because of the music. And Anjali could tell that the vibe had shifted, which is why she is all smiles as she watches from the lower deck. ( Photo below ). A successful evening indeed despite the cold and the rain showers. As we were going to find out, the fun was just beginning! Akanksha and I had moved to the lower deck to sit and get some photographs of the guests when suddenly there was even more energetic music playing upstairs and then there was this! What a riot of colors and and some of the guests also joined the beautiful dancer as she twirled around the floor that is otherwise crowded with lunch tables! We had our flight back to Delhi the next day and didn’t want to stay out too late, so we headed back to crash. The Writer’s Ball was not only great for hobnobbing with writers and other well known people in the business of publishing, it was also a very successfully executed cultural evening. I’d say I’m getting better with the mirror selfies. Just before bed, after I’d changed but hadn’t yet removed my makeup. Next day we were up early and the first thing we did was to check whether our flight was on time. Luckily the hotel staff was already on it and before we had a chance to leave the hotel, we were told that the flight was delayed by two hours. We were still having breakfast at Latest Recipe when we got that piece of information, so we decided to hang out a little more. We also ended up meeting the lovely Rupali Dean ( she’s also written about her experience at the Writer’s Ball on her blog ). And then it was time to head to Jaipur airport, which is about 40 minutes away from the hotel. We bid farewell to the staff and to the hotel – thank you Prateek for taking good care of us and fielding our dozens of phone calls. We truly appreciate the hospitality! Thank you for having us over Anjali and we look forward to many more wonderful, culturally laden experiences with you. 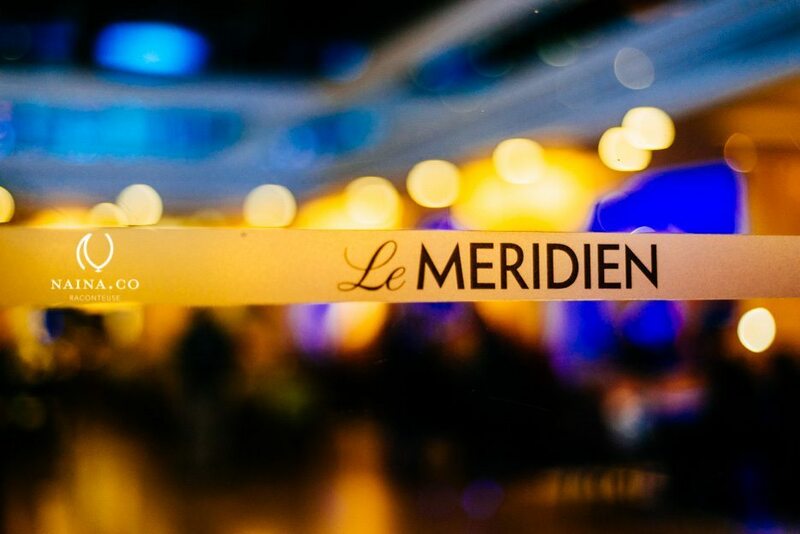 Thank you Le Méridien! Previous stories from this series : Day 01 and Day 02.